Frequently Asked Questions About BOOKING LIVE ENTERTAINMENT How do I go about booking live entertainment? PLAN: Start planning early to make sure that you get the music of your choice. BUDGET: Prepare a budget. Keep in mind that the price for live music will depend on many factors such as the time, date, size of the group you desire, performance length as well as travel time. STYLE: Consider factors like repertoire, musical style, and of course, the nature of your guests and audience. CONTACT: Call us and we will discuss your requirements and concerns. Based on the above criteria, we will send you demo CD's, videos, etc. We also have event forms online that you can fill out and send to us to give us further information to get you the precise entertainment for your event. Keep in mind that our web site has a wealth of information and will provide you with most of the tools necessary to make a good decision for your music entertainment. We have band descriptions, testimonials, pictures, song lists, questions and answers for any event you are planning as well as song clips for most of our artists. We are here to help you and offer guidance in any way for you. Once I have found the band I want, what do I do next? If you are sure that you have found the right band, do not let them get away! You might not be the only person considering that particular band, and if they get a firm offer before yours, they will probably take it. Most bands, the higher quality ones, are booked out three months to over a year in advance. You will need to sign a contract and put down a deposit (the percentage will vary according to the band you choose) to secure that particular date for your event. We are aware that last minute entertainment needs do arise and we are prepared to help you often with just a couple of days notice. Do bands learn special requested songs if they are not on their song list? If you request a special song for your occasion, the bands will be happy to learn and perform them. You must provide them with both the recording and lyrics of the song. Likewise, if there are songs that you don't want played, you must tell us and we will notify the band. They will be happy to honor your wishes. How do I know if the band I want is available? Once you have decided on the band that you would like, we will contact them to confirm their availability. We will notify you and you can make a decision. How long do bands typically perform? It depends on the type of performance. For a corporate function or wedding reception, the musicians will usually perform for four hours. You can, however, arrange for additional time. A concert generally will last between one to three hours. There are so many variations of events, it is best to Call us and we will discuss it with you. What happens if the band does not show up? If for some unforeseen circumstance the band is not able to attend, as soon as we are notified, we will do our best to find a suitable replacement that you will be happy with or we will refund all of your money. Will I receive a contract? All bookings will first be confirmed verbally. Next we will mail you a contract. This contract is your guarantee of your booking and confirms all of the fine details, which would include arrival times, instruction on payment, etc. It will also include terms and conditions of the booking. I'm concerned about the volume of the band. How can I be assured that the music won't be too loud? All of our artists are extremely conscientious of their sound when they are performing. During the dinner, they will play background music enabling your guests to carry on a conversation. When your guests are ready to hit the dance floor, the music will be adjusted accordingly to provide the correct level of sound. If you still have questions? 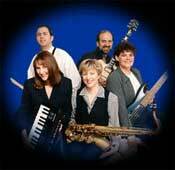 Licensed & Bonded New England Music Entertainment Agency Serving MA, NH, ME, CT, RI & VT.